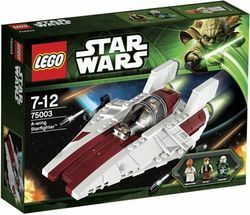 75003 A-wing Starfighter is a Star Wars set released in 2013. It contains Admiral Ackbar, plus redesigned Han Solo and A-wing pilot minifigures. The RZ-1 A-wing interceptor was a starfighter developed by the Rebel Alliance, and was considered to be one of the fastest mass-produced interceptors in the galaxy. Green Squadron, a unit of A-wings, participated in the Battle of Endor. The squadron's task was to disable the ion cannons present on the Star Destroyer fleet so that the Alliance fleet was able to manoeuvre into position to attack the Executor. 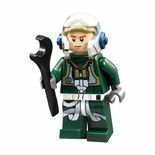 Whilst leading a run on the Executor, Arvel Crynyd (Green Leader) was hit, and his craft spun into the unshielded bridge of the Super Star Destroyer, causing it to lose control and be destroyed after crashing into the Second Death Star. This is a description taken from LEGO.com. Please do not modify it. (visit this item's product page) Battle the Imperial Fleet with the super-agile A-Wing Starfighter™! Bring the battle to the evil Empire with the Rebel Alliance's super-fast A-wing Starfighter! As featured in Star Wars™: Episode VI Return of the Jedi™, the agile A-wing, with an opening cockpit, is perfect for attacking the Imperial Fleet! Build the same lightning-fast ship that destroyed Darth Vader’s Executor! Then, take on the Imperial forces with Admiral Ackbar, an A-wing pilot and Han Solo! Collect the A-wing pilot helmet, being featured for the first time ever by LEGO® Star Wars™! Bring the battle to the Imperial Fleet! The A-Wing pilot's helmet is a new piece. The word "Warning" (in Aurebesh) is displayed on the dashbroad. Ackbar's marks on his headpiece are slightly darker than in his first appearance, in 7754 Home One Mon Calamari Star Cruiser. Facts about "75003 A-wing Starfighter"
This page was last edited on 9 January 2016, at 20:51.